Model T Ford Forum: Correct rear spring bolt? 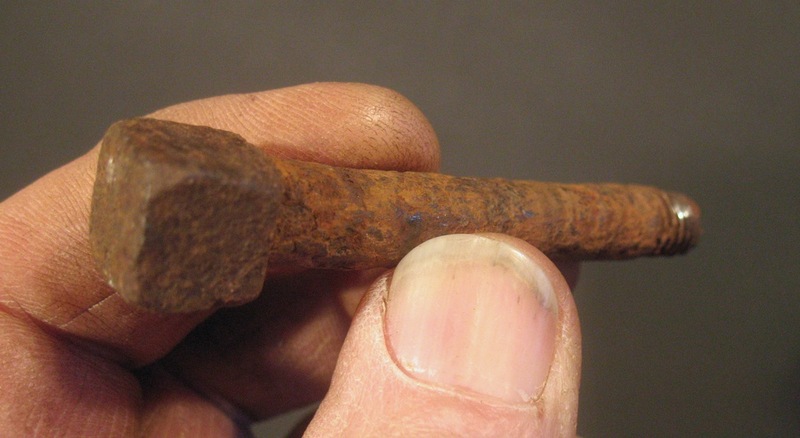 Model T Ford Forum: Forum 2013: Correct rear spring bolt? This broken bolt was in the tapered rear spring I'm using on my 1915 runabout. Unfortunately, it's the only one I have. I'm guessing the original length, not counting the head, was 31/2". ...and 17/32" across the flats. Is this the original Ford Bolt? Is anybody making it today? I expect the answers are yes and no, but I want to be sure before I make it myself. A unique bolt Steve but I do not have an answer to your question. The repop bolts are good,but the head isn't. I braze a square nut on top of them and they work OK. 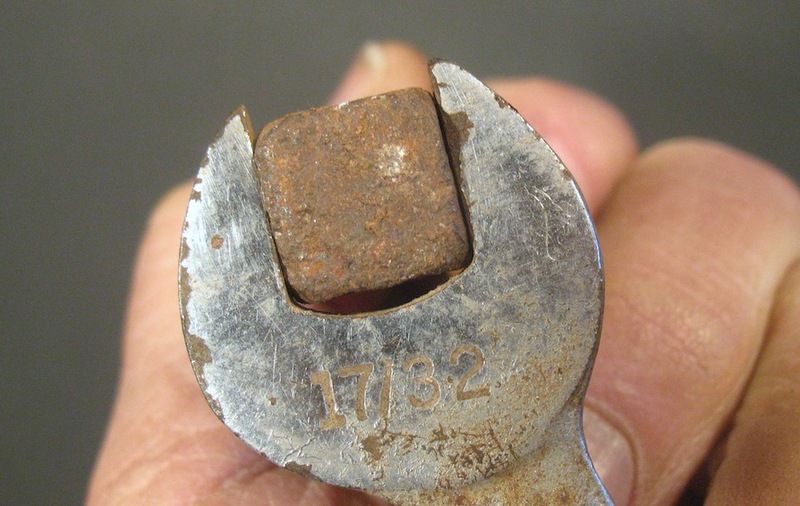 I've never seen a bolt like that on a T. Ford didn't make a wrench that size. Really doubt its original although its certainly been in there a long time, Don. I've seen a couple like that, one of which was on a 1916 touring car, another very similar on a 1910. It broke too. I think I kept the top part in case I had to make one up. I think you need that high head to make sure it keeps seated in the frame. Steve, it probably isn't much help, but the Ford Price List shows that bolt for a roadster as part number 3837 and the nut as part number 3837B. Both are listed for 1909 - 1925. There is a note that says roadsters with six leaf rear springs use bolt part number 3838B, but it lists the applicable years as 1924-25. There is another note that says sedans with the nine leaf rear springs use bolt part number 3838 for years 1922 -25. I did not see an illustration of any of these part numbers in my book, sorry. 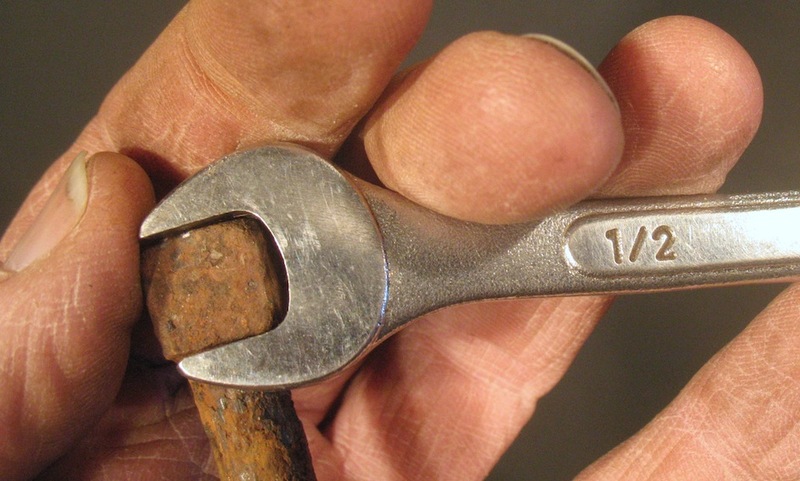 You wouldn't need a special wrench for that one. It's the spring centerbolt and the square head locates the spring in the crossmember. I don't know if it is original, but it sure would be nice if the ones that are available now had a good tall head like that! The new ones barely show above the leather or rubber pad that goes between the spring and crossmember. It's just about impossible to get the head of the new bolt located in the hole with the pad in place. Jack's idea of brazing a square nut on a new bolt is a good one. I have a car that someone put a carriage bolt down through the top of the crossmember and then assembled the spring in place, leaf by leaf. It works, but it's not right and I can't take the spring out. It's a someday project. I'll fix it someday. I have NOS 3838 rear spring bolts that came out of Strong Motors in Atwater, MN (in the original drawer out of the parts department with the label on the drawer). 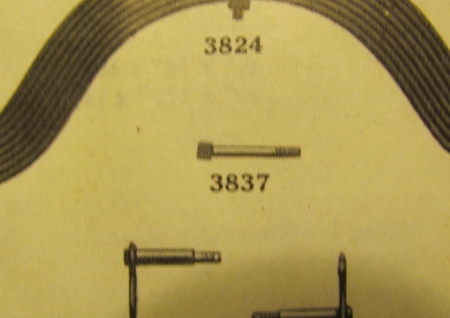 The later bolts 3838 don't have as high of head as the earlier bolts 3837. My dad's '17 has the high head bolt. Bob's website says he has them, but there's no picture, you might want to contact him to see if his have the correct tall head. Snyder's also has it, but their illustration shows a shorter head. No one makes a bolt like that anymore. My October, '17 touring car had one like that on the rear springs. Pretty sure you have an original there Steve. The tall head makes it really easy to get the bolt located into the square hole in the rear cross member and with the proper leather pad, the bolt head ends up flush with the top of the cross member. The rear spring on our 13 touring has a tall head bolt like that. It is rusty but still doing the job. That bolt that Steve posted is indeed correct. I recently had a similar problem with the front spring bolt. The heads on the repros are not thick enough. Bob Bergstadt came to the rescue on that one, as did Stan Howe. The ones Stan sent are fine threads, which I think is better. I had to take some off the top because it was a little too tall, and I had to remove some from each side too to get the bolt to slide up into the frame, but I'm delighted with the result. We have wonderful guys in this club, who come to the rescue when the need arises! I am dealing with this bolt problem as well on my front end rebuild. What is the proper bolt I should be using on my early 1922 Touring? According to the parts price list I have, the part number for the front spring tie bolt is 3811 and the corresponding nut is 3811B. Again, no picture in my book. Back in 1925, these two parts would have cost you a whopping 6 cents (4 cents for the bolt and 2 cents for the nut). Hey thanks Mark. How did you get to that page much less the index? I do not see a link on the Chaffins Page to get there. I searched on Google for "spring tie bolt 3811" and it sent me there. It must be an old dead page that Chaffin's main website no longer supports. That bolt looks like the one I took out of my 16's rear spring, broken at the same place. I bought a replacement from Langs and it worked fine. Yep, the new one will work. It's just wrong. If the differences weren't so glaring, maybe I'd use it. But I'm going with NOS, which is on its way. Way to go, Steve! Glad I was able to help.